We are offering a few select apartments for sale in one of the most charming and sought-after neighborhoods of Paris. Each apartment has been painstakingly remodeled and furnished to the highest standards, and offers you the pleasures of your own beautiful home in the City of Light. Step outside each morning and you'll be spoiled with the many choices of charming Parisian cafés, patisseries, bistros, fashion boutiques and nearby market streets. You'll fall in love with the Parisian life in the village-like atmosphere of the Left Bank. Stroll along the Seine at sunset and return to a beautiful home where you can relax and enjoy the company of family and friends. 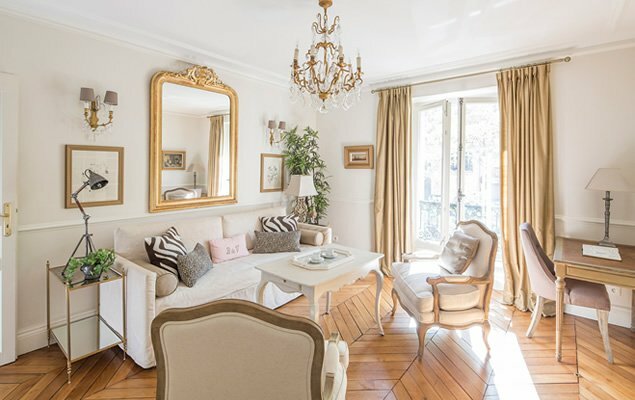 We're offering a sublime apartment for sale as a fractional Paris apartment offering. Located on the Left Bank of Paris, the apartment is designed to meet the needs of those who dream of owning a second home in Paris. This extraordinary apartment enables buyers to own an extraordinary vacation home in a dream destination. Each share entitles the owner to four weeks per year in Paris. The apartment is exceptional, a spacious one bedroom, 2 bathroom property with balcony and Eiffel Tower view. The award-winning service of Paris Perfect makes this an exceptional opportunity. If you love Paris and want to spend part of each year in Paris at a very reasonable cost, this is the property for you.